When you install Nimble Steamer via this instruction, you need to complete the first step called "Install Nimble server" and stop before following the next step about registration - you will need to use a special command. It will register your existing server back with the same ID and apply existing settings. It will allow WMSPanel to work with new instance just like it's the existing one. To find this special command, you need to click to Servers top menu, then click on existing server name. You will see server info with Recovery Manual button. 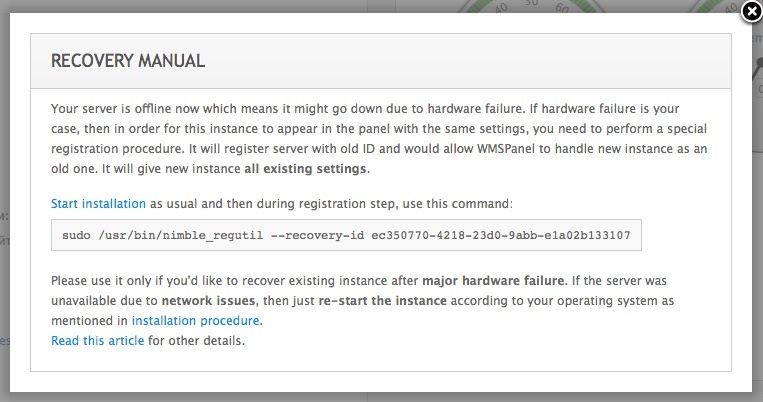 Clicking on it you will see a recovery dialog explaining this operation and showing the command to be used for the recovery. Notice that the directories may be different according to the location you chose during Nimble Streamer installation. Run this command and your server will be registered. 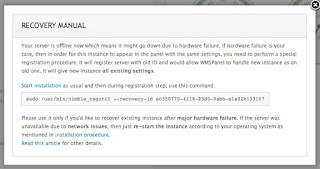 Reload the Nimble instance and your server will be shown as Online, with all configs moved to it. This is one of the advantages of using WMSPanel. Using our service you will have a convenient UI to control your entire infrastructure. Another great example is Nimble deployment automation and adding the existing Nimble via web UI along with its config.